I was back in Yeppoon on Sunday and decided to see if the fingermark were still around at Emu Park. It would be low tide just after dawn and the winds would be light from the north-east. The temperature was a bit lower than it had been when I was last here and the water was not as clear. I had repaired the tip on my slightly heavier rod, which is ideal for this kind of fishing – the NS Blackhole Cabin 2 S862L, rated 8-14lb, 2.59m long. I match this with a Shimano Sustain 4000, loaded with 15lb Super PE braid and I started with 14lb fluorocarbon leader and a 1/8th, 1/0 jighead. This rod is great for fishing with soft plastic lures and small hard bodied lures and slugs. It has the power to land a decent fish but is still quite sensitive. As is often the case the first 30 minutes of the session produced the most action. I rigged up a GULP 3” Minnow in the Watermelon Pearl colour and cast it out towards a semi-submerged bommy. As soon as I pulled in the slack there was a fish attached and it took off. A few moments later I landed a decent sized fingermark – about 45cm long. After a few more touches, I decided to put on a larger soft plastic and chose a 5” Peppered Prawn Jerkshad. After a few casts, I felt a very solid bite but when I struck the fish was not there. I cast back in the same spot and let the soft plastic sink and sit on the bottom for 10 seconds. When I lifted it, it was slammed and line started peeling. A few moments later a very big fingermark – well over 70cm leapt clear of the water. I was still attached but even my bigger rod was no match for this fish. It kept running and soon had itself wrapped around some rocks. There was a bit of see-sawing and the fish was gone. I re-rigged with a GULP Crazylegs Jerkshad in the New Penny colour. As soon as I cast this out it was slammed, as it sank. It was another big fish and it took plenty of line. I did not get a look at it, as it also buried itself in the rocks and the leader snapped. I continued fishing with the bigger soft plastics but everything seemed to have shut down and I did not get another bite. The next morning I was back, at sunrise. There was more water over the rocks as low tide would be about an hour later. I beefed up my leader to 20lb fluorocarbon, as I wanted to try and hang on to any big fish that I could hook. I was pretty confident but nothing much happened with the big soft plastics. After about 40 minutes something grabbed the a GULP Crazylegs Jerkshad in the New Penny colour. It was too slow for a fingermark but it was still crafty and tried to lodge itself under the overhanging rocks. After a minute or two, I pulled up a decent sized cod. I dropped back down to a smaller soft plastic – the GULP Swimmow in the Peppered Prawn colour. This soft plastic has a small paddle-tail and creates a tight vibration in the water, as you retrieve it. After a couple of casts with this I felt a very light bite, I paused and struck, but there was no fish there. Next cast – same thing. Next cast, I left the soft plastic on the bottom for about 10 seconds and as soon as I lifted it … the fish was running with it. After a short fight, I saw a flash of silver. A few moments later, I landed a 40cm grunter. By about 7.30 am everything seemed to shut down. I walked around the whole headland casting, but all I could collect were more small cod. At about 9.00am it was hot and I was tired, so I gave up. Time for one last session at Fishing Creek before heading back to work. It would be a late morning low tide with not much wind to start with. There was no need for very early start as the creek would be too full of water to wade along, until about 7.30 am. I was back to fishing light. I was using my recently acquired Berkley IM6 Dropshot GEN IV 6’6″ Light Spin two piece rod, rated 2-4 kg. I paired it with the Shimano Stella 2500 loaded with 8lb Fireline and a 12lb fluorocarbon leader. I had a few of my favorite GULP soft plastics and small DUO hard bodied lures, in my chest pack. I started with the trusty GULP 3″ Minnow in the Watermelon Pearl colour on a 1/8th ounce, size 2 hook jighead. This soon found a few small flathead. Wherever I found flathead lies in the sand I cast around until I found the fish and it usually worked. I swapped to a 3″ Minnow soft plastic in the newly available Red Green Sparkle colour. GULP have recently released a few new colours in Australia and this is my favorite amongst the newcomers. The new colours fill in a few gaps in the range. I will not try to describe the colour but have a look at the photos attached to this post. The new colour did not seem to have much trouble and after a few casts, I christened it with a small flathead. As the tide ran out I followed it about 3.5 kms down the creek. My constant companion was an eagle looking for a free lunch. 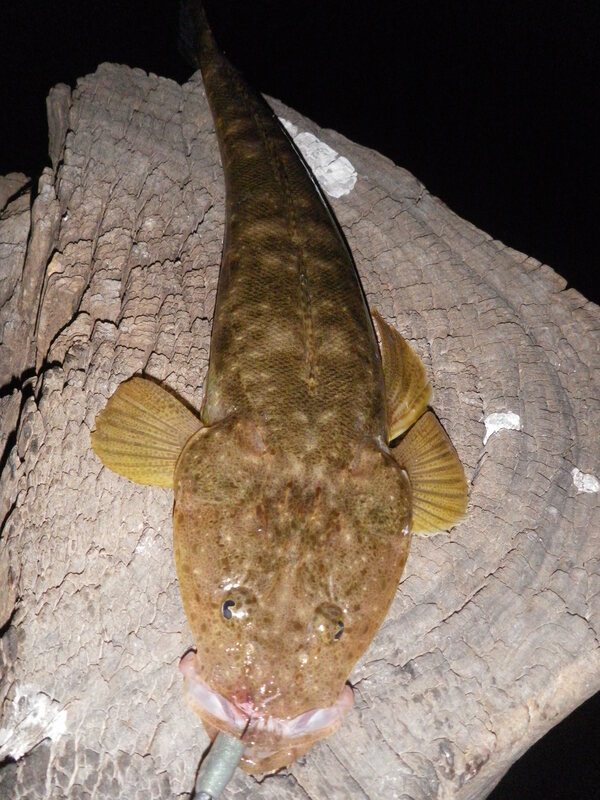 I kept catching small flathead but there were not many keeper size ones around. I swapped back to the more natural coloured Watermelon Pearl Minnow and this produced a decent estuary cod. At about 11.30 am, as the wind picked up and I was about to give up for the day, I found a reasonable sized grunter bream. 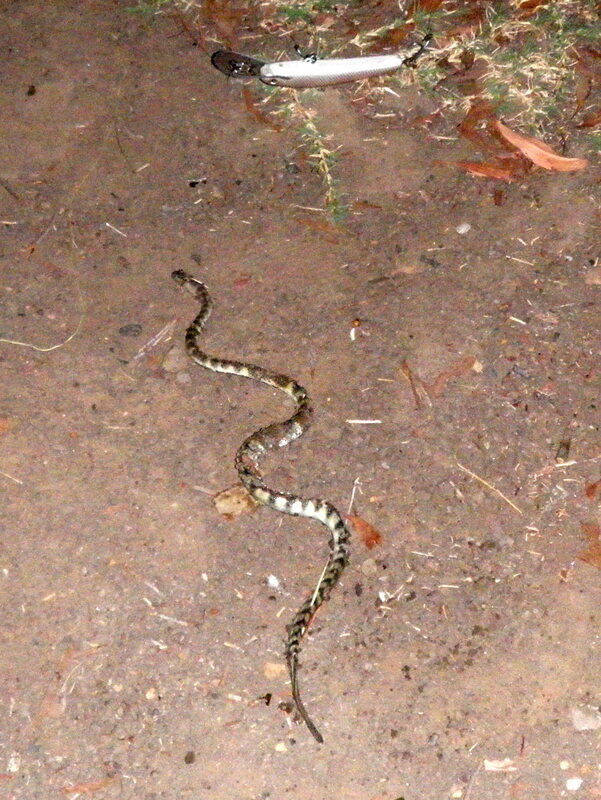 I released it and made the long trek back to the car. Not many big ones, but plenty of fish – which I think makes for a good session. 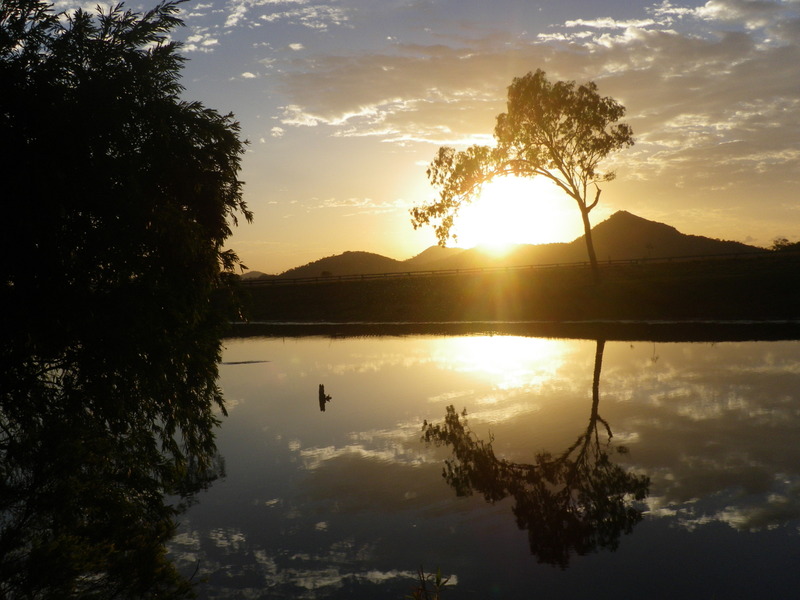 More time stuck in Rockhampton – which is not necessarily a bad thing. I decided to go looking for a freshwater barramundi. It was just a few days before the barramundi closed season came into effect. I had chosen to stay at Henderson Park Station – http://www.hendersonpark.com.au/, in one of their cabins. Henderson Park is a working cattle property which has a lodge and a couple of cabins which are situated right on Hedlow Creek. 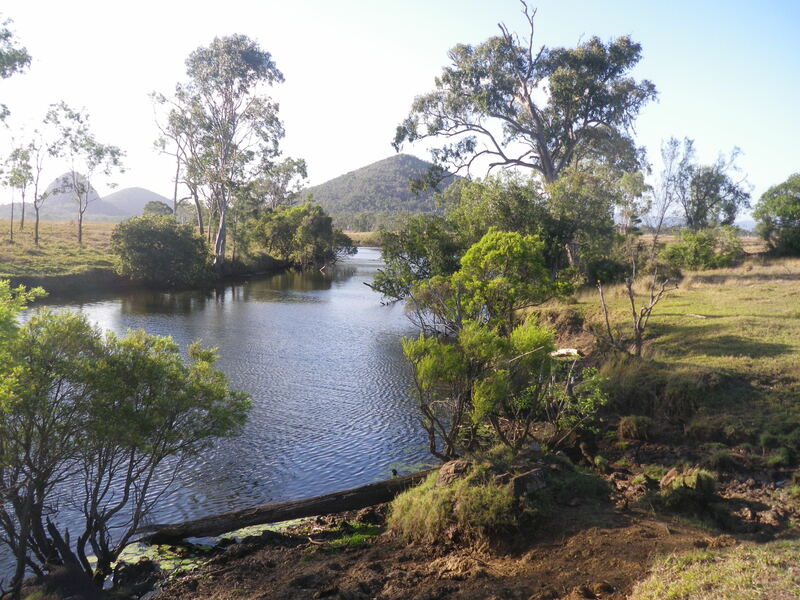 Hedlow Creek is a fairly narrow freshwater creek about 10 km long, just north of Rockhampton. It has been regularly stocked with barramundi fingerlings and also has sleepy cod and a few other species of native fish. The creek is spring fed from either end, so never runs dry. The Henderson Park cabins are located on the west bank for the creek, within casting distance of the water. The scenery is spectacular and I think this is about the prettiest place in Queensland to chase a fresh water barramundi. The creek is accessible from the public dirt road on the east side, but if you stay at Henderson Park, you can access the water all along the west side, as well. The owners said there were some big barramundi in the creek and that casting soft plastics at dusk or dawn, around the fallen timber, had been the most successful way to connect with them. I have to confess that I have been here before and only caught catfish but I have seen pictures of some great captures, so I was determined to have another try. The fantastic thing about this waterway is the amount of structure. There are fallen trees and overhanging branches all along it and there are some nice deep holes. There are only a few places where the creek gets wider than about 20 metres, so for much of its length you can comfortably cast from one bank to the other. On my last visit I had fished a couple of dusk sessions and only one morning. 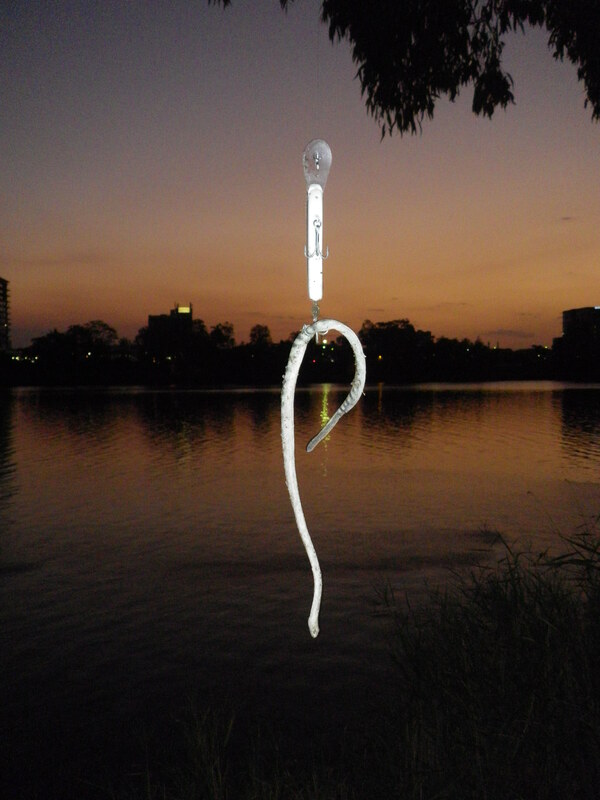 I had used lightly weighted soft plastics – GULP Shrimps, Minnow and Minnow Grubs and caught perhaps 10 small catfish. The main challenge was losing jigheads to the numerous sunken logs and other snags. All this structure would have made using hard bodies a pretty expensive business. This time I decided to focus on the early morning sessions. That meant being awake at about 4.00 am and walking out along the banks of the creek, as the horizon started to glow at about 4.30 am. Instinctively, I felt the grub tail soft plastics might attract a strike. Loaded on a 1/12th or 1/8th ounce jighead, their fluttering tails sinking down next to a snag, might be tempting. In hindsight, I realise I was fishing far too light. I had 8lb Fireline as mainline and 16lb fluorocarbon leader on the light Berkley Dropshot spin rod. I started with the GULP 3” jigging grub on a 1/8th 1/0 jighead, in the neutral looking “Smoke” colour. I moved along the bank to the north of Hedlow Lodge, stopping to cast at any likely looking snag or log. At about 5.45 am I stopped beside a fallen trunk that stretched out to a point well over half way across the creek. I cast my soft plastic just north of the trunk and let it slowly sink. I paused and retrieved the soft plastic in a slow and steady motion, along the line of where I thought the sunken tree must lie. I have watched endless fishing shows and been told you have to be persistent with barramundi. They will ignore 20 casts and finally lose their temper on the 21st and strike. Well, I received a very personal lesson – and it all happened in the blink of an eye. I had put in perhaps 25 casts using various retrieves – slow vs fast, regular hops vs a steady wind. I lobbed out another cast and let it sink around where I thought the end of the sunken log might be. I let the lure sink and paused for perhaps 10 seconds. When I lifted the rod tip the soft plastic stopped dead and then after less than two seconds the reel was literally spinning and a huge wake was moving towards the bank on the far side. The fish then broke the surface, close to the other bank and I could see it was a very big barramundi. This had all happened in about 5 seconds and it was only now that I realised that the fish had taken the lure under the fallen log. I could feel the line rubbing as it lunged and pulled. After about 15 seconds there was a great tail slap and the line went slack. The contrast of the incredibly violent and powerful attack with the peaceful dawn scene of a few moments before, was total. My hands were still trembling and my heart pumping, as I slowly wound the line back on to the reel. Miraculously the mainline had held as had the knot attaching it to the leader. The bite off or break, had been a long way down the leader close to the jighead. The line from “Jaws” sprang to mind: “We are gonna need a bigger boat” (substitute rod, line, leader, jighead for ’boat’). I waited for my hands to stop shaking and re-rigged with 25lb leader (the toughest in my chest pack). I moved gradually north along the bank and caught a couple more catfish but by about 10.00 am, I had not had any more interactions with the barramundi, and the wind had picked up, so I gave up for the day. Next morning, it was more or less the same drill, up at 4.00 am and fishing by 4.30 am. This time I swapped up to a bigger 4” Jigging Grub in the Peppered Prawn colour, on a tougher 1/8th ounce, 3/0 jighead and the 25lb fluorocarbon leader. I moved much further north along the creek, to a large bend where the west bank is lined with a couple of fallen trees. I cast around them, losing a couple of jigheads to the sunken branches. It was a case of methodically covering the area with casts and again, persistence paid off. I was casting at the far bank and slowly hopping the lure back along the sides of submerged tree branches, which were on my side of the creek. 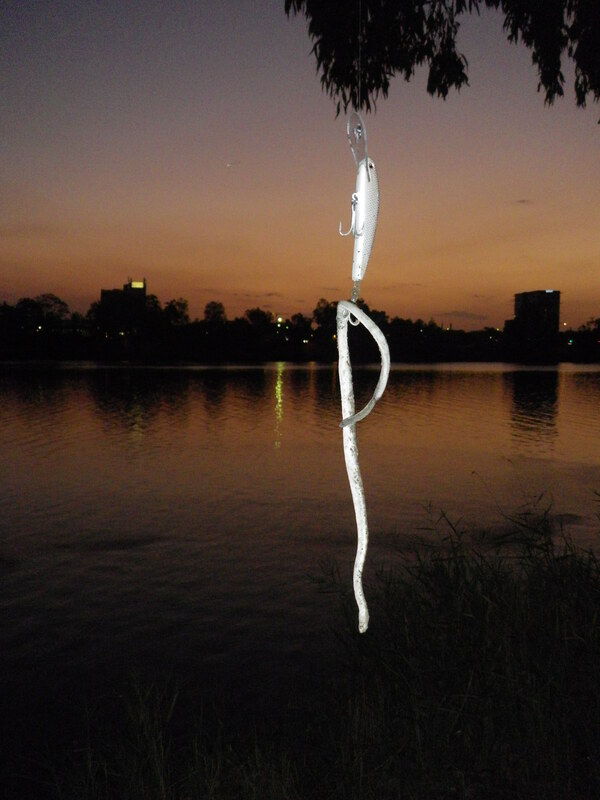 About ten casts into the process a huge, green shouldered, silver scaled shape, launched itself up, from under a tree branch and dived down over the soft plastic, as it was suspended, about 30cm from the bank. This looked like a smaller fish than the one from the day before, but I would estimate it was still over 80 cm long. It took off for the far bank with amazing speed and power. It was heading for some timber on the other side and by virtually locking up my drag, I pulled it clear. Then it came back towards me and torpedoed across the surface, shaking its wide open mouth trying to spit out the jighead. I really had no more stopping power in the rod and reel, so I was at its mercy. It paused briefly and I thought I might have a chance and then it took off again and there was the sickening feeling of the line rubbing against timber. I loosened the drag a little to see if it would swim free but it just kept tearing around until the line snapped at the main line to leader knot. I carried on fishing around that area and tempted a couple more catfish, but no more barramundi. It looked like I would not be getting a big freshwater model until next season. I had only had a couple of encounters but it was enough to bring me back – and next time I will be properly equipped. 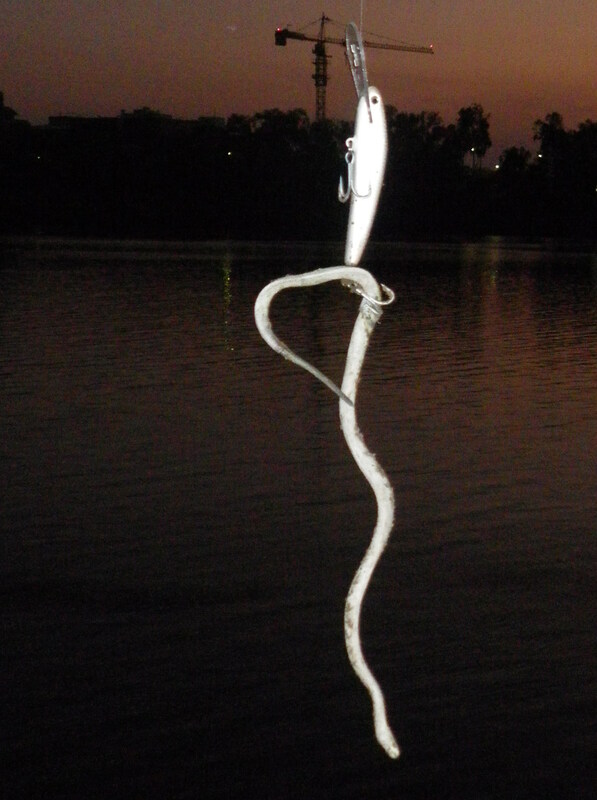 I came across this keen angler a few weeks ago, on the banks of the Fitzroy River. He was fishing with live bait and told me a few good stories about catching monster barramundi and salmon in these waters. He has already caught more metre plus barramundi than I probably ever will. Glad to see that not all the youth of today are glued to facebook and the playstation. 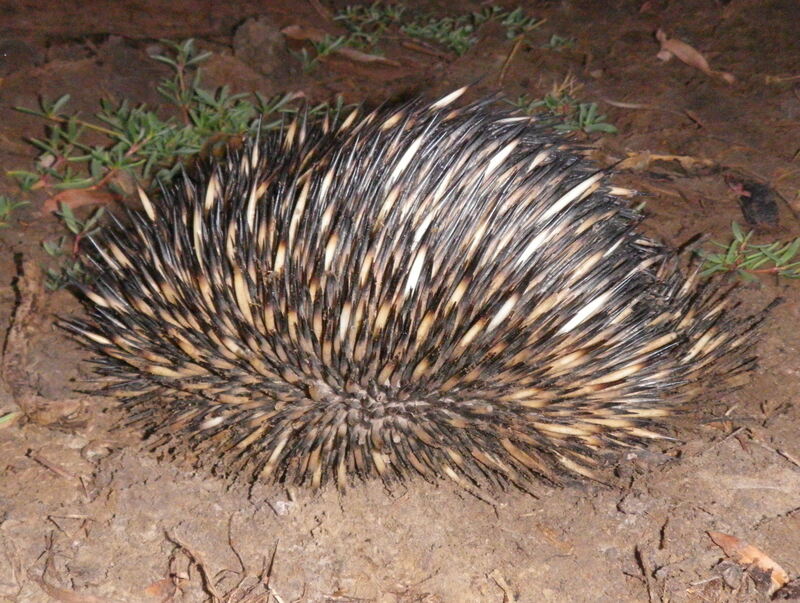 Up early and back out to Emu Park to see if I could find more fingermark. I had the replacement Berkley Dropshot and the Shimano Stella 2500 was pretty well suited to it. I upped my leader to 14lb fluorocarbon, mainline was original fused Fireline, rated 8lb. I have probably said this before, but I love the original fused Fireline in the fluoro/yellow colour. It casts well, I can see it in low light and it is extremely tough. The only downside is that I need a new spool of it after every 5/6 sessions, when its starts to fray and breakdown. I have tried Berkley Exceed and Nanofil but these are not an improvement on the original. Just make the original more durable please Berkley. I arrived just after 5.00 am and there was a bit more water over the rocks and the wind was up. It was an easterly, blowing about 10 knots. There were a few clouds around, but rain was unlikely. The moon was a waning crescent with the new moon not due for about a week. The tide was running out and would be low just before 10.30 am. The first fish was a tiny striped perch who grabbed the soft plastic, in close to the rocks. Next came the obligatory small cod. I fished for 30 minutes and caught a few more small cod. Perhaps the Fingermark had moved on. Just after 6.00 am I found them again – maybe they were having a lie in. The first one made a tentative nudge at the soft plastic lure as it sank (a GULP 4” Minnow in the Watermelon Pearl colour), then it (or one of its companions) followed it in to the shore and thumped it right at the edge of the rocks. It took off and the added strength of the Berkley Dropshot was immediately apparent. It was a good size fish so I actually loosened the drag a little to avoid straightening the hook or pulling it out, and let the fish wear itself out. A minute or two later I had it at my feet. It was another very nice fingermark, well over 50cm long. I released it, tidied up the soft plastic lure, re-positioned it on the jighead and cast it out again. Two lifts of the rod tip and bang, I was on again. It was another slightly smaller fingermark. The fish were definitely eating now. I released it and cast out again. This time the soft plastic did not reach the bottom. A fish walloped it and took off for New Zealand. A couple of times I felt that I might be slowing it down, but it was probably just pausing for a rest. I gradually tightened the drag but it did not make much difference. This fish was big and I could not really apply any pressure. Eventually the line went slack and I pulled in a bent jighead. The jighead was a TT Headlockz series; 1/8th ounce , size 2/0 hook. These carry a GULP Minnow 4” soft plastic very nicely. I have however, straightened a few of them. I think the heavier gauge hook necessary for the Headlockz system gives the impression they are heavier duty than they actually are. In my experience the original fine gauge Tournament Series TT/ Gamakatsu jigheads (in the orange backed packet) are actually tougher than the Headlockz. Having said that, I would probably not have landed this fish with a 6/0 heavy duty jighead – it was just too powerful. I re-rigged, this time with a bigger GULP 5” Jerkshad but after 10 minutes, this produced nothing. I swapped back to the smaller GULP 3” Minnow first in Peppered Prawn and then in Watermelon Pearl colour. I caught three smaller fingermark on each, over the next 30 minutes. It seems lure size was important to these fish. At about 7.30 am I caught a small estuary cod and that was it – everything suddenly went quiet. I tried a few different soft plastics and moved to a few other spots around the headland, but it seems the fish had shut down again. Another great session and a good way to warm up a new rod. First stop was the tackle shop in Rockhampton, to find an emergency replacement for my broken light spin rod. The G.Loomis GL2 range has moved on since I bought mine. I found all the available G.Loomis ‘fast’ action rods a little too stiff for my liking. I think this is because the new, higher quality graphite has less give. I decided to look at something cheaper with a little more give. I settled on a 6’6″ Berkley Dropshot, rated 2-4 kg, two piece. It would do, until I could look into a more refined replacement. With the Barramundi closed season fast approaching I felt I should try another session, land-based fishing in the Fitzroy River, at dusk. The boats were thick and there where plenty of land-based anglers wandering the banks. Everyone was keen to tempt a Barramundi. The tide was running out and had been high at about 4.00 pm. The wind was north-easterly but its was dropping off. The folks in Barra Jacks (http://www.barrajacks.com.au) had loaded me up with traditional hard bodied suspending minnows and 45 lb leader but the reports from the Barra Bounty competition (a few weeks earlier) had suggested many anglers had been successful using small soft plastics. Obviously, I had a few packets of these as well. I started fishing at about 5.30 pm behind the bowls club on the north side of the river, with a locally made, timber hard bodied suspending minnow lure in a silver colour. There were a few surface slurps and I could see decent bait schools swimming around. As the sun dropped on the horizon I felt some resistance and wound in. I had something but I could not see what. As I pulled it clear of the water I realised it was a sea snake. Is there no end to the predator list up here! I managed to shake it loose from the line and it slithered off, back to the water. I decided to swap to soft plastic and put on a GULP 3″ Minnow in the Peppered Prawn colour, on a 1/8th ounce, size 1 hook jighead. It was now almost completely dark. I walked along the bank casting wherever there was an opening in the tall grasses. Just before seven I felt a fish grab the plastic and I was hopeful. After a couple of small runs I realised it was a flathead. It came to the surface angrily shaking its head. It was about 45cm long. I released it and gave up for the day.